Very helpful and Bimble had no problem delivering solar panels to my boat on the canal in London. Great service. Excellent always a joy to deal with. I had a few questions they made suggestions and even set up the checkout for me. 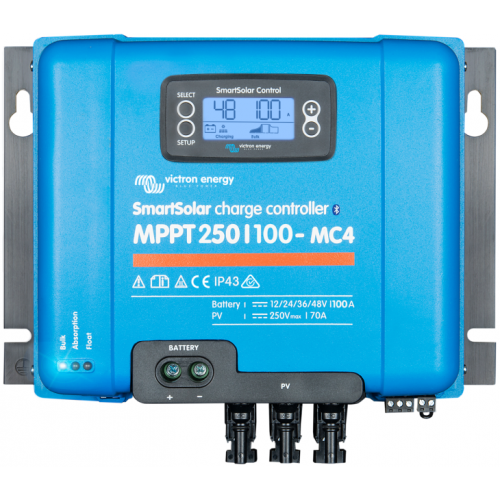 By constantly monitoring the voltage and current output of your solar (PV) panels, MPPT technology ensures that every drop of available power is rinsed out of your panels, and harvested for storage. The advantage of this is most noticeable when the sky is partially clouded, and light intensity is constantly changing. Remotely control and monitor the extensive features of your SmartSolar MPPT charger with built-in bluetooth by pairing it with your smartphone or other device via VictronConnect. If your installation is connected to the internet Victron Remote Management Portal (VRM) provides access to the full power of your MPPT, anytime, anywhere; both services are free to use. For remote installations - even when there is no internet connection or phone signal nearby - you may be able to monitor your MPPT by bluetooth-pairing with a LoRaWAN(long-range wide area network) device, available optionally. By adding the SmartSolar Control Display you will be able to check the status of your Charger and battery-storage at a glance. Simply plug it into the face of your MPPT charger to provide you with real-time monitoring and set-up capabilities.